There are few things that Wayne Hutchinson has yet to experience in the game of hurling, even less in the game of life. But as he looks forward to leading Munster champions Ballygunner into battle against near-neighbours Ballyhale Shamrocks in tomorrow evening's AIB All-Ireland Senior Club Hurling Championship semi-final, he admits that both he and his teammates will be opening a "new chapter" after such a long break in competition. A full 83 days will have passed since Stephen O'Keefe and Shane Dowling goals set the Waterford men on their way to a much coveted second Munster Senior Club Hurling title, overcoming Na Piarsaigh in the process. Five consecutive Waterford crowns had shown that this current crop of Ballygunner players were by no means underachievers, but there is no doubt a monkey was expelled from the back, after emulating the heroes of 2001, who took the O'Neill Cup to the banks of the Suir for its first visit. The completion of that particular book ensured celebrations were boisterous and plentiful at James McGinn Park, and indeed, upon the high stool in many of the city's watering holes. But at some point, attention had to return to the writing. "It was a long time coming so we enjoyed the couple of days after it", grinned the captain. "I suppose there is only so much celebrating you can do, you have to get back to reality, just enjoy the moment. There comes a time to move on". It would take a hardened soul to begrudge Fergal Hartley's side their fun, after a character asserting run through their provincial campaign. A come from behind victory against Midleton in the quarter-finals was followed by an absolute epic against Clare kingpins Ballyhea in the semi. The Mahoney's shocked life back into a side teetering on the edge of yet another Munster Championship disappointment. Phillip first, with a crashing goal to force extra time, twenty seconds beyond the allotted two minutes of injury time. The first twenty-minute cycle couldn't separate the two sides, but eventually, the Bannermen wilted on the energy-sapping Walsh Park pitch. Pauric Mahoney, eventually knocking over a free after almost ninety minutes of play, to allow Ballygunner to progress to an all-together more straight forward affair against Na Piarsaigh. However, Hutchinson feels that the momentum garnered from the autumnal adventures will have little-to-no significance in Thurles tomorrow. It is a long time, you are talking two and a half months since the Munster Final. We played really, really well in that game. We needed to play really well, but the point I'm trying to make is that form doesn't really matter now. It is a new book, there is a new chapter being opened. Form from individuals and as a team goes out the window because it is a new season. Two and a half months down the line is a new season. It is just unfortunate the way the calendar is that it goes into a new year and you have such a big break. You obviously have the Christmas period, then you have January, it is all on the day, whoever brings their best performance to the table. It's a sizeable obstacle for Hutchinson and co. to scale, when weighing up the opposition. Having made a habit of picking up Leinster medals over the last fifteen years, the Shamrocks are well versed in the application of the New Year turnaround. It's an advantage that the Ballygunner skipper concedes in a game that promises to be nip-and-tuck, given the geographic proximity between the two parishes. Even though it is Kilkenny and Waterford there is a feeling around that it is a local club game. From club to club is only a 30 minute commute or drive really. We obviously have played them down through the years in challenge games. This is our first time to meet them in Club Championship hurling. They have been in this position before, we haven't so this is new territory for us. Again whoever manages that time in between and I think Ballyhale have an advantage in that they have been here before. They know what it takes to get ready for a semi-final, while we are at a stage where it is new ground for us. We are going into the unknown, we just have to prepare as well as we possibly can. At the end of the day it is about the 60 minutes on Saturday, that is what really matters. All the usual clichés apply. 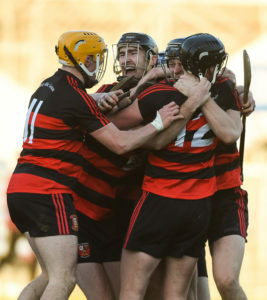 Semi-finals are for winning and Hutchinson is well aware of the carrot this generation of Ballygunner hurlers have dangling within touching distance. Clarinbridge proved a bridge too far for the Gunners in the semis back in 2001, but there is a genuine belief that this squad can go one step further, albeit facing the daunting task of staring down the Fennellys and TJ Reid tomorrow. "They're a serious outfit. They blitzed Ballyboden and it's going to take a good team to stop them. We want to win the game. We'll need to be 50% better (than before) if we're going to beat this Ballyhale team". The pen goes to the page around 5pm tomorrow evening.